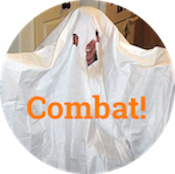 Sarah Palin completes transition to Jeff Foxworthy - Combat! This picture chosen entirely for the logo on the podium. I am 32 years old. Rarely has Palin’s status as a lifestyle product been more evident than it was telling redneck jokes to the NRA on Friday night. As the 2008 election becomes an increasingly dreamlike memory, her public remarks have increasingly abandoned explicit political content in favor of assertions of identity. Part of that likely follows from her involvement in the Tea Party, which has consistently taken a stronger interest in establishing itself as an Important Political Movement than in articulating specific policies. Yet Palin’s lifestyle politics exceeds even that. The Sarah Palin of 2010 resembles a conservative Oprah more than she does the Sarah Palin of 2008. She seems to have learned two lessons from that year: 1) politics is hard and 2) white people with pickup trucks think she’s pretty. That’s an insulting assessment of Palin’s constituency, but it’s little more insulting than her own. 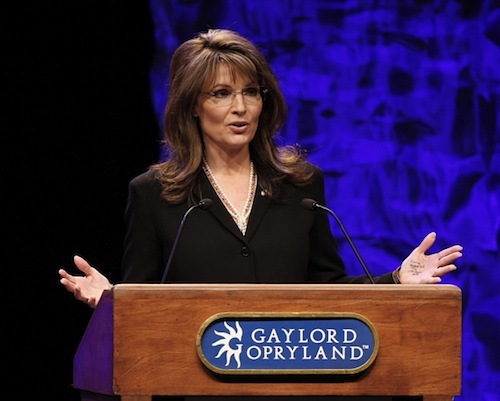 You might be redneck “if you ever spent the night in the back of your truck rather than paying for a hotel room,” Palin told the audience in Charlotte, before adding, “We still do.” No, you lying churchwoman, you don’t. As we know from last month’s leak, Palin’s speaker contract requires “a pre-registered one-bedroom suite and two single rooms in a deluxe hotel,” along with first-class plane tickets or a donated private plane, provided it is “a Lear 60 or larger.” Since resigning the governorship of Alaska last year, Palin has made an estimated $12 million. When she says that one Christmas, Todd gave her an ice auger and she gave him a gallon of gas for his snow machine , she’s not lying,* but she sure isn’t talking about this Christmas. This Christmas, Sarah Palin was rich. She got that way by telling poor people how like them she is. Exactly why that worked is a matter of conjecture. Matt Taibbi, who may be the angriest man ever to smirk, sees in Palin’s success the denominating lowest in all of us. “Palin has figured out that…all you have to do to win elections in this country [is] flatter middle Americans’ moronic fantasies about themselves,” Taibbi writes. “It’s basically a risk-free strategy. You get up on stage and you say, ‘I’m just like all you idiots. And you idiots rock! '” By telling the country that “real Americans” are the ones who hang out in the town where they grew up and watch a lot of TV—as opposed to, say, getting degrees in constitutional law and becoming community organizers—Palin guarantees the support of the mediocre, which is historically a large bloc. Taibbi’s assessment is appealing, if only for the sharpness of its disdain, but it still doesn’t explain why the You Idiots Rock strategy wins elections—or, for that matter, if it does. It’s easy to forget this, but before Sarah Palin became a national phenomenon, she became the nail in the coffin of John McCain’s presidential campaign. She’s demonstrated that a false populism can make you rich, but can it get you elected? Palin’s popularity seems to have increased directly with her abandonment of actual political speech. Sure, she appears at NRA meetings and Tea Party conventions and rallies, but her message is almost entirely cultural at this point. She’s like William Jennings Bryan: the Great Commoner, rallying an imagined America while remaining utterly unelectable in the present one. Somehow, Sarah Palin has stopped talking about politics to become the most exciting figure in politics today. What that says about the country and how we run it remains to be seen. But you might be a redneck if your favorite politician never runs for office again. There’s also the fact that every time she steps out of the conservative media bubble and speaking circuit she experiences some spectacular disaster. For me, the best example of her total incapacity to do anything right is the Turkey Incident, where after pardoning a turkey she did a Thanksgiving interview in front of turkey-killing machinery while it was in operation, turkeys being stuffed into a death-pipe. Allegedly the station employees asked her before hand if she wanted to film right there or move someplace else, and she said there was just fine. How do you even do that? How do your people /allow/ you to do that? And how could anyone (e.g. Taibbi) believe that somebody who would do that could survive a political campaign? People pay far too much attention to this woman. Her supporters have invested all their dreams in her; her detractors have invested all their fears in her. She’s not a vessel worthy of carrying either. As one of her detractors who doesn’t fear her at all, I have to disagree with you there, Haplito. Her supporters love her because she represents everything they think is important, but I think a lot of liberals who follow her do so because she’s hilarious, like a character from a John Waters film come to life. For me, Palin’s relentless gaffe-making is actually a relief, because it often seems that if the current queen of movement conservatism is this stupid, they can’t really be that much of a threat.